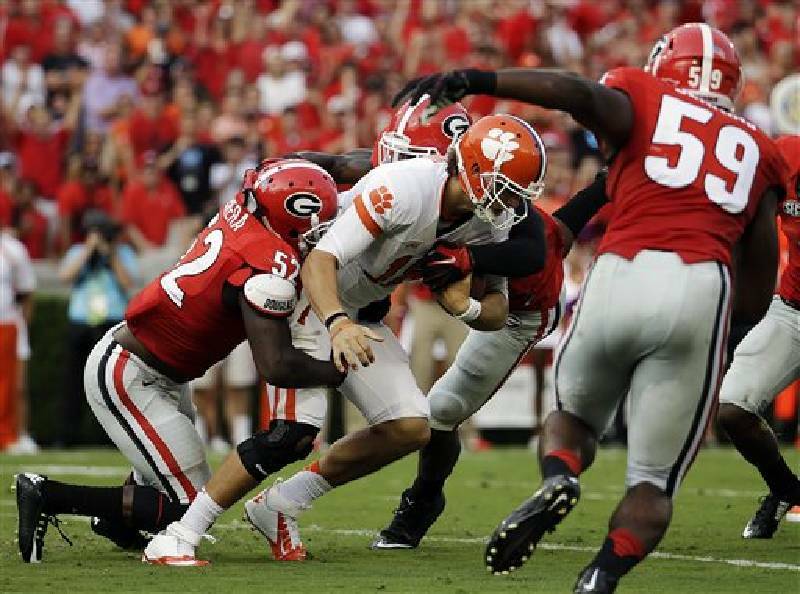 Clemson quarterback Cole Stoudt is sacked by Georgia linebacker Amarlo Herrera (52) in their game on Aug. 30, 2014, in Athens, Ga.
Amarlo Herrera was the starting Georgia linebacker who wasn't getting a lot of attention entering last Saturday's opener against Clemson. Fellow inside linebacker Ramik Wilson had gained preseason All-America honors after leading the Southeastern Conference in tackles last season, while outside linebackers Leonard Floyd and Jordan Jenkins were appearing on some of those "breakout player" lists. Herrera, who finished second in the SEC a year ago with 112 tackles, kept to himself under the radar. "I don't care. All of that is just clutter," Herrera said before the opener. "I don't pay attention to that, because there can be guys on those lists who wind up not doing much of anything. I'm not worried about all that." In last week's 45-21 thumping of the Tigers, the 6-foot-2, 231-pound senior from College Park, Ga., amassed 12 tackles, 3.5 tackles for loss and two sacks. Named Monday night as the inaugural SEC defensive player of the week for the 2014 season, Herrera holds the early league lead in tackles and tackles for loss and is tied at the top in sacks. The Clemson game was the 42nd of Herrera's career with the Bulldogs, and it was his 31st start. "He had a lot of production -- tackles, sacks and tackles for loss," Bulldogs coach Mark Richt said. "Amarlo had a good offseason and got his weight in a good spot where he could be as quick as he could possibly be while maintaining his strength. He did a good job throughout fall camp of trying to get better but also trying to help lead his teammates, and now he gets rewarded with a good performance. "I'm glad he had a big game, because he worked hard toward that." Herrera, who often calls out plays for his defensive teammates, headed a unit that held the Tigers to 15 second-half yards, including minus-19 in the fourth quarter. Known to provide the simplest of answers in news conferences, Herrera was asked Saturday night if it was more pleasing to avenge last year's loss at Clemson or to make such an emphatic statement in the debut of new coordinator Jeremy Pruitt. "I was just happy to be playing ball again," he said. "This was my last first game at Georgia." The defensive calls, according to Herrera, are far simpler under Pruitt compared to those under predecessor Todd Grantham. He added that they're not as long, so "you can spit them out easier." Herrera is about 15 pounds lighter from a year ago, which he said is largely the result of bidding farewell to two of his favorites -- chocolate and fried foods. "I''ve been pretty disciplined when it's come to that," Herrera said, beginning to smile, "but you also get a day to cheat. When you get that cheat day, you've really got to work harder those next couple of days." Herrera's 3.5 tackles for loss last week were more than he had as either a freshman or a sophomore. His 12 tackles matched the career high he set during last season's double-overtime win at Georgia Tech, and he had just half a sack for his career before last week's outburst. If he can string together more games like last Saturday, the leaner Herrera will have a lot of laurels coming his way. "Of course he's been overlooked, but he didn't complain about it one time," Wilson said. "He knows all of us view him as a great player and a great leader. He's going to go out and give it his all, and people are going to recognize it." Said Richt: "He's certainly a guy we have a lot of respect for. For most guys, all that matters is how his coaches and teammates see him."